Nearly 250 animals, including 17 rhinos and more than 166 hog deer died within a week after one of the worst floods in Assamled to the submergence of the Kaziranga National Park (KNP). The flood water also encroached upon the camps of forest guards. Between July 25 and July 31, the park also lost 11 wild boar, nine swamp deer, six sambar, three buffalo, two hog badger, one porcupine and one python. The death toll is likely to rise after the entire floodwater gets out of the park. Forest teams have managed to rescue at least nine rhinos, 90 hog deer, one jungle owlet, three swamp deer, one fishing cat and one python. The rhinos are currently undergoing treatment at the Centre for Wildlife Rehabilitation and. Conservation (CWRC), India’s only wildlife field hospital in Kaziranga. Every flood is followed by “fodder scarcity” that pushes animals to southern Kaziranga in search of food. Wildlife conservationists are concerned over the fact that the rhinos will be vulnerable to poaching as they stray outside the park boundary in search of food. The issue of poaching during flood was also raised in 2015. Shortage of grass and food for the animals is one of the reasons why mortality rate is so high among small animals like hog deer and calf rhinos. The rhinos are safe as long as they stay within the park since patrolling is constant. Flood waters, hopefully, make it difficult for poachers to operate. The moment the animals step outside the park, they come under threat. 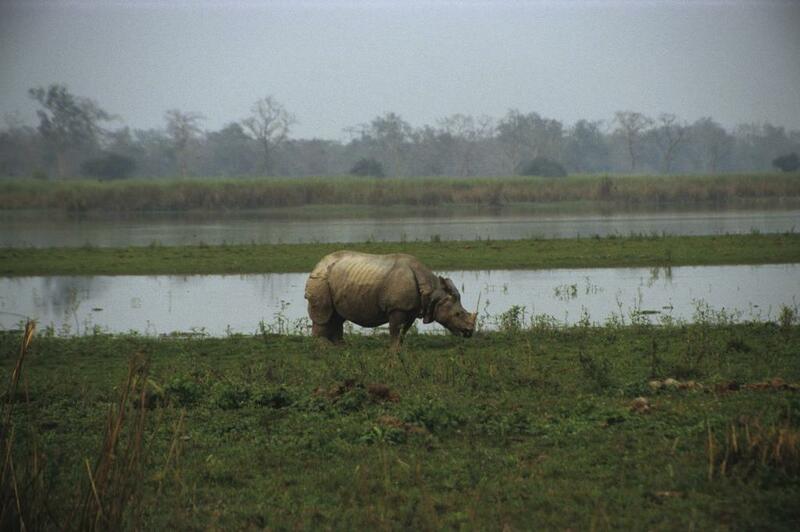 With people living near the park in Golaghat district leaving their homes because of large-scale inundation, the rhinos have become more vulnerable to poaching. The threat is high as each rhino horn fetches between Rs 8,000,000 to Rs 1 crore. Moreover, they can be easily shipped out of India through the Nagaland border. It is also a challenge for the forest officials to keep the animals free from diseases as this is the time when they are prone to get affected by pneumonia. This year’s flood has already been dubbed as the worst since 1998. Although flood is very important for Kaziranga as it replenishes water bodies and destroys elephant grass so that it makes a fresh start and grows into heights suitable for the animals, this year’s flood has been too “aggressive”. During normal floods, rhinos move towards highland as soon as the water level rises and cross the national highway and go towards Karbi Anglong area. This year’s intensity of flood was too strong for cub rhinos to move during this migration for food and shelter. There are over 70 elevated platforms or man-made highlands in the park to save animals. However, not all those platforms could withstand this year’s floods. The flood situation in Assam is showing signs of improvement with the water level receding in the last few days. Although the flood level has receded, about 80 per cent of the Park area is still submerged. What’s the level of flood preparedness in Kaziranga? Kaziranga National Park, home to a total of 2,401 rhinos (as of 2015), also has about 35 species of mammals along with 1000 swarm dear, 100 tigers, 1000 elephants and 1500 wild buffaloes.